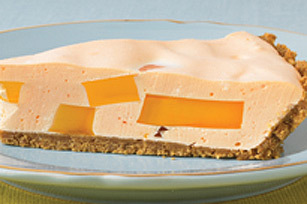 Looking for a fruity no-bake pie? The search is over - try this easy citrus-flavoured dessert with its creamy orange filling and buttery crumb crust. Stir 1 cup of the boiling water into dry lemon jelly powder in medium bowl at least 2 minutes or until completely dissolved. Stir in 1/2 cup of the cold water. Pour into 8-inch square pan. Refrigerate 4 hours or until firm. Add remaining 1 cup boiling water to dry orange jelly powder in large bowl; stir at least 2 min. or until completely dissolved. Stir in remaining 1/2 cup cold water. Refrigerate 20 min. or until slightly thickened (consistency of unbeaten egg whites). Combine graham crumbs and butter together in 9-inch pie plate. Press onto bottom and up sides of pie plate to form crust. Set aside. Cut lemon jelly into 1/2-inch cubes or decorative shapes. Add to orange jelly along with the whipped topping; stir gently until well blended. Refrigerate until mixture will mound. Pour into crust. Refrigerate at least 4 hours or until firm. Reduce butter to 2 Tbsp and use Light products and save 100 calories and 4 g fat. Prepare as directed, using Jell-O Berry Blue or Lime Jelly Powder to make the jelly cubes.